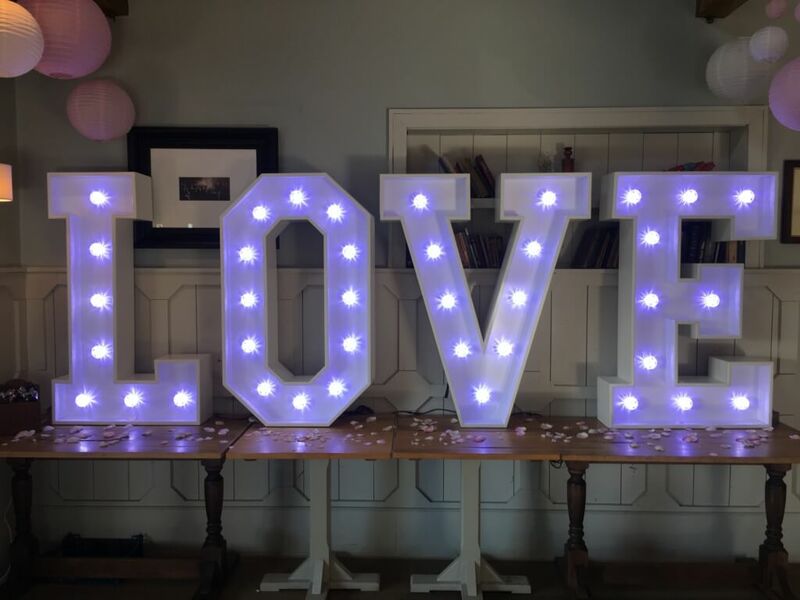 We are happy to now stock these stunning LED light up LOVE letters for hire. These letters look amazing anywhere in a venue. They can be set to any colour via a remote control or you can opt for classic warm white. LED lighting is safe to leave on around children. We supply these in London & Surrey but can deliver anywhere you desire for a small cost. These large light-up letters stand 4ft tall and add that WOW factor & sparkle to your wedding. Each letter stands independent from the other letters allowing placement of each to be completely separate from the other. These decorations ideally complement our white starlit dance floors. We can also add wireless uplighters around your wedding venue & even project your name or initials onto the walls, making your very special day that bit more unique. Our letters have been professionally made. Each letter is powered individually and PAT tested for electrical safety. We can supply these anywhere in London & Surrey.